"Dr. Villalobos is hands down the best physician I have ever had. She really cares about her patients and is patient, kind and extremely informative when it comes to diagnosis. She is gentle when it comes to examination and carefully considers options before helping you to choose one. Then if that doesn't work, she perseveres until she finds something that works for you. She is extremely accepting, calming and altogether thorough, filling prescription orders immediately and following up more than sufficiently. Dr. V works around my schedule as I am a student, and is very understanding of all other circumstances unique to me. I could not have asked for a better OB/GYN." Drs. 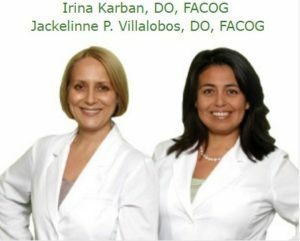 Karban and Villalobos first met as medical students in the mid-1990’s. Since then, their careers in medicine followed nearly parallel tracks as they both completed their internship and residency requirements at the same hospital in New York and continued to work within that institution for nearly 10 years before relocating to Houston, Texas. As persons, we are approachable, sincere, and caring. As medical professionals, it is extremely important that our patients understand that we are knowledgeable, skilled, and experienced. As women and mothers, we have an understanding of and compassion for the changing healthcare needs during the female lifespan. As board certified physicians, we are dedicated to providing exceptional obstetrical and gynecological care, adapting customary and the most advanced standards of medical treatment.